The creation of this card was filmed, so I made a video tutorial showing the process start-to-finish. 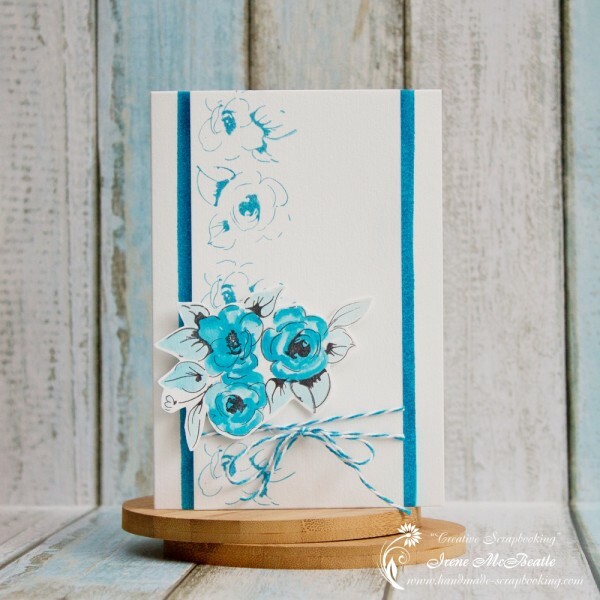 The card is very simple and requires a minimum of supplies. It’s design is based on Altenew stamps and one color of Distress Ink. I like clean and simple cards. 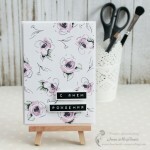 And I like using my imagination to make an interesting card with just a few products. And now you can watch my video tutorial. This is my first video in English. Please don’t be too critical and let me know if you like it. 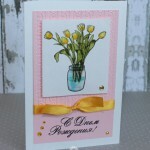 I used Altenew Painted Flowers stamp set for this card. I mounted two flowers on the acrylic block. Next I inked them with Mermaid Lagoon Distress Ink color and stamped repeatedly along the edge of a piece of white cardstock. Then I moved to another piece of cardstock and stamped flowers and leaves images in black waterproof ink. I randomly created my composition. I used a waterbrush and the same color of Distress Ink to create a watercolored look for my image. It actually took me about 4 minutes to complete the coloring. 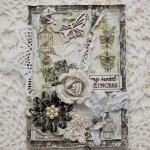 After that I fuzzy-cut the image with scissors to create my own embellishment for the card. I scored my card base to make a side folding card. Some masking tape helped me to create a straight line along the edge. I used my grid mat to align it. Next I pressed the mini ink pad over the tape and smeared ink in the direction towards the middle of the card front. I replaced the masking tape and repeated the same on the other side. Before assembling the card I took a piece of twine and wrapped it twice around the central piece that I’ve created earlier. I tied the twine with a bow. I adhered this front panel to the card with foam tape. And I also used foam tape to put down the flower piece. Love your card and the video.